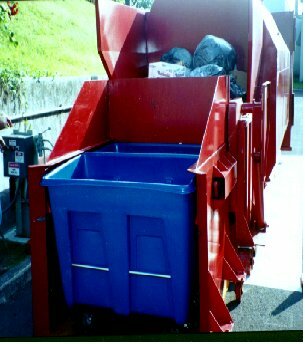 Moss supplies self-contained compactor/containers as part of a complete overall system. These durable compactor/containers come with a variety of options so that they can be tailored for your site-specific application. They can be supplied at dock level with a dock level dumper so that processed waste can be loaded into the receiving hopper hands free. 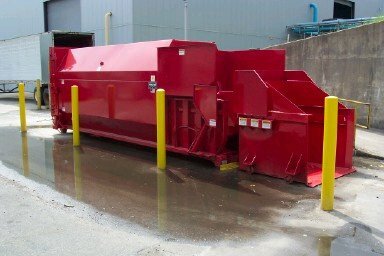 If a loading dock is not available we offer ground level or integral ground level dumpers (as shown) that can pick up and dump both regular solid waste along with the sterilized waste all in the same unit.